Exclusive access to 21 short videos featuring Sigmund, who will set up the lesson plan of the day. Each lesson includes a downloadable/printable Teacher’s Guide. Video access expires August 1, 2019. Plus: A special edition copy of a book by Sigmund. 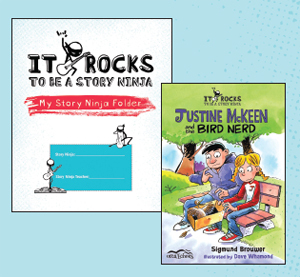 You may order up to three additional My Story Ninja Student Folders for siblings at $5.00 each. During checkout, you will be asked to provide the teacher’s name, email address and total number of students using the Story Ninja Program.